I started Day 2 by posting coverage of Day 1 of VMworld and all things of note since after landing in Barcelona. Then there was the run to the venue. Coincidentally, I got the same seat in the keynote as on Day 1 and next to Barry Coombs and Megan Warren. The keynote was mainly a repeat of the US version but also announced initial availability of VMware HCX Technologies with IBM and OVH and is planned for late 2017. Once finished, I ran to meet the rest of the guys on the Open TechCast, to do last minute preparations for our interview with Sanjay Poonen. Then came the actual interview, which went extremely well. You can hear all about it in our episode here. Then it was time for some lunch and a visit to Solutions Exchange. One can easily spend a few hours in there and that’s exactly what happened. By the time I got out, it was almost evening. That meant giving my tired legs a bit of relief and wait for VMworld Customer Appreciation Party to start. One thing that people always forget and I tweet about every year: On the night of the party, bag drop is open until 11 pm at night. So, there’s no need to run to the hotel, if all you want to do is dump the bag. However, if you want to look nice and fresh, then that’s a different matter altogether! Party time came and we headed towards it. As always, the atmosphere was great and food aplenty. 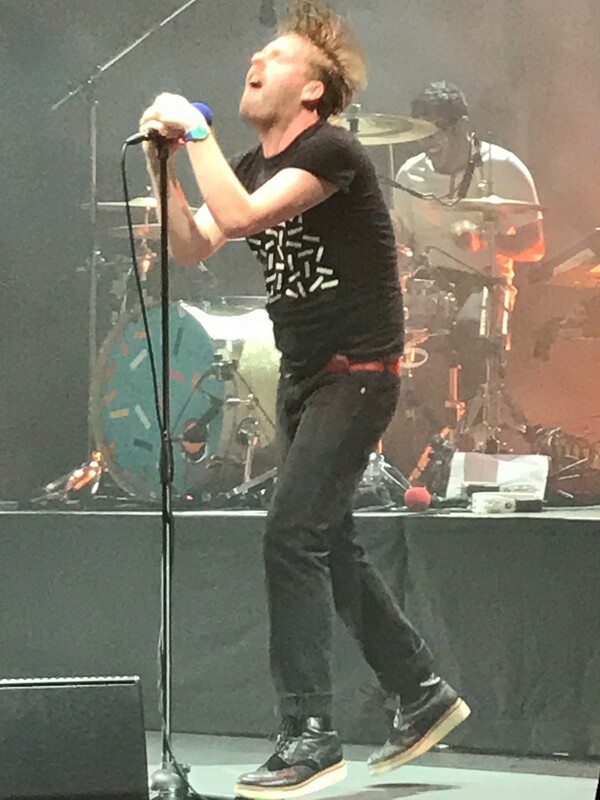 Once we stuffed ourselves properly, it was time for Kaiser Chiefs. They played a decent set with strategically placed old hits, which got the crowd going every time. In fact, the crowd enjoyed it immensely throughout and called them back for an encore. Great picture, isn’t it? (if I say so myself). Caught Ricky Wilson mid-flight from quite far away (zoomed and not cropped at all) and no, he didn’t have a Mohawk. That ended Day 2 for me. It was time to go to the hotel and catch some sleep before the final day. Day 3 was quite relaxed but a fair number of people had to leave early due to one reason or another, which was a shame as I missed meeting some of them. I spent most of the time at the Solutions Exchange, talking to various vendors and just soaking up the atmosphere. Like I always say, it’s great to see vendors of all sizes but especially the smaller ones as you never know, who might become the next big thing a couple of years later. In between those visits, I also went back to our usual gathering place, the blogger’s area. At one of those times, Andreas proposed to take a photo and of course, we complied. After a bit more exploring, I suddenly realised I should head towards the airport as many people were reporting long queues, due to industrial action (fortunately, there weren’t any when I actually got there). And that was it! VMworld over for another year. 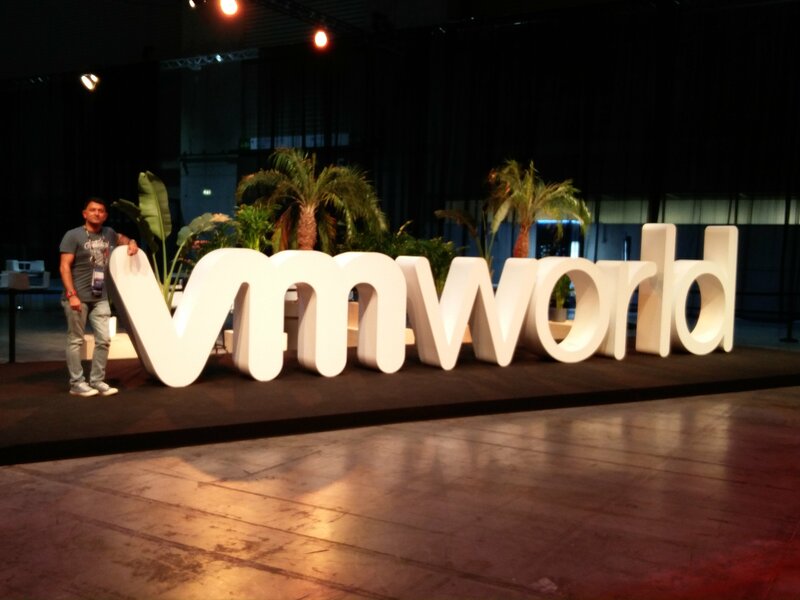 It was yet another great VMworld and while we say it every time, it was the best one ever! Immensely enjoyed meeting old and new friends but also, bagged two great interviews as well. In case you haven’t heard yet, next year’s VMworld Europe is in Barcelona too and on 5 – 8 November 2018. Pencil in the dates in your diary now!